This weekend Adam and I went to the Indiana Artisans Marketplace in Indianapolis. We got tickets through one of Adam’s best friends, Andy. Andy designs and makes beautiful custom furniture. Andy is in business with his dad and they have been a part of Indiana Artisan for a couple years. Their work is often used by designers at show home events and he even has been featured in some log cabin magazines. You can learn more about their company, Cole and Sons, Inc, and see their work at their website. Like their Facebook page, too! Adam and I had fun checking out his featured pieces and seeing Andy drumming up new business. We also had fun seeing all the other artisans creations. There was jewelry, paintings, pottery, wood working and more. Everyone was incredibly talented. However, one group of artisans really stuck out to Adam and me… the Foodists! There were wine makers and craft beer brew masters. Lots of honey and candy makers. BBQ sauces and rubs. And it gets even better…! Adam took this picture of our artisan damage. 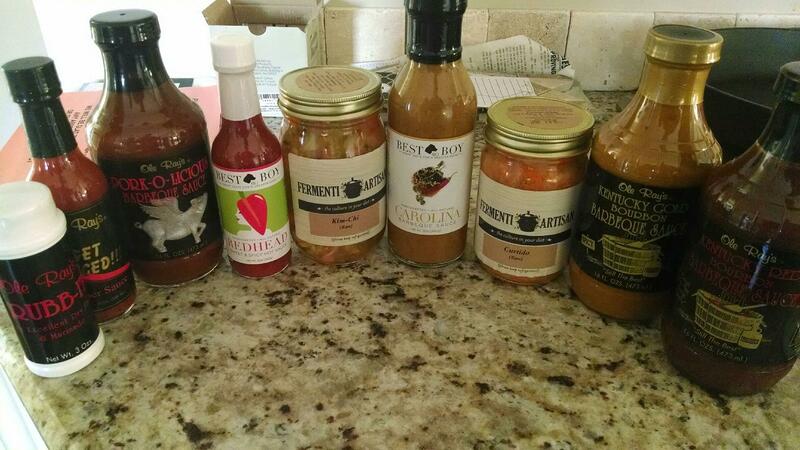 I am pretty sure that we now have enough barbecue sauce to get us through the summer. 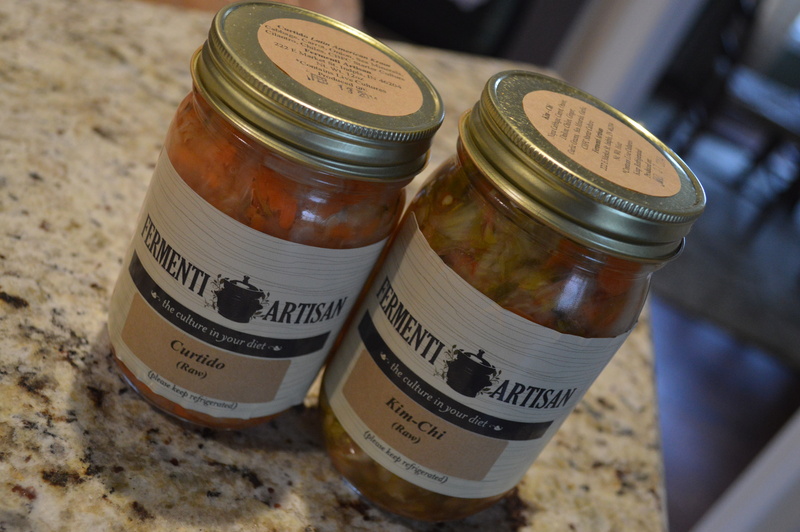 One thing I was particularly excited about was the jar of Kim-chi from Fermenti Artisan. Kim-chi is traditionally a Korean side dish that is made up of different vegetables and seasonings that ferment together in a jar for some time. I read a lot about Kim-chi last summer when I read Michael Pollen’s Cooked. In Cooked, Michael studies cooking through the four classis elements of the world: Fire, water, air and earth. 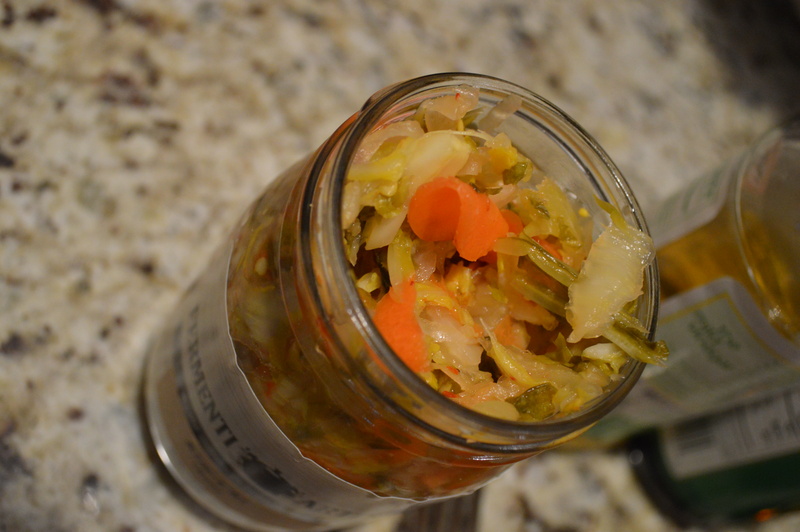 In the “Earth” chapter he dives into fermentation with sauerkraut and Kim-chi. Much of it was super scientific and well over my head. And, in the spirit of being honest, to me, that chapter dragged. However, it did make me realize that I needed to try Kim-chi. My opportunity arrived a few weeks ago when out to eat with girl friends and I spotted it on a menu. It was served with tuna and I was surprised how spicy and tasty it was. I knew Adam would love it as he is a big fan of all things spicy. I had been looking up recipes to try to make my own, but then I saw it at the artisan marketplace. I knew we had to get some. We also got some curtido, which the reps at the marketplace said works great in Mexican dishes. 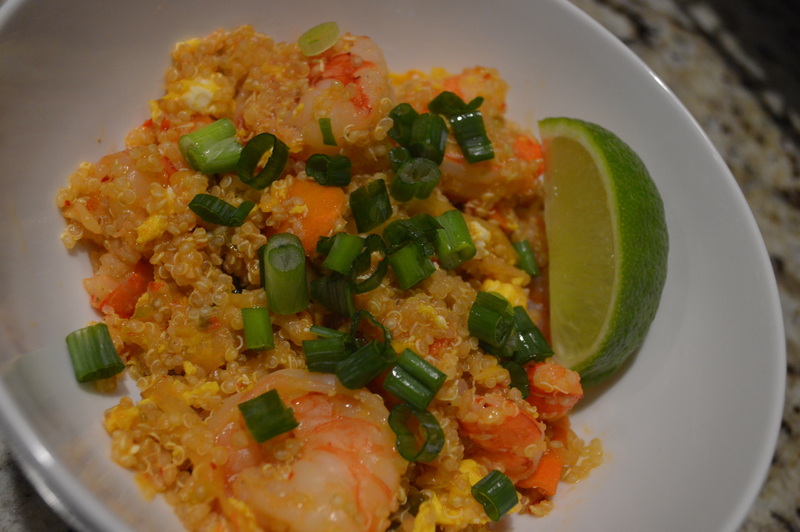 We used it on Monday night for a take on fried rice using quinoa and shrimp. Adam and I both had big bites of the Kim-chi right out of the jar before we began cooking. It was spicy just like the Kim-chi I had a few weeks ago, but it didn’t have the typical “pepper” spiciness. It was a fresher spicy… which is ironic considering it is literally rotting vegetables. What might be even more ironic is that these rotting vegetables are actually good for you. In fact, Kim-chi is considered a “Super Food.” It’s full of vitamins like many other super foods such as kale, but what makes it different is it has a healthy bacteria culture that helps with digestion and, some studies show, prevents the growth of cancer. And, as if Kim-chi could get any cooler, Korean’s actually say “Kim-chi!” like American’s say “Cheese!” for a picture! Cook cup of quinoa according to package. Set aside. Add oil to a large skillet or wok pan. 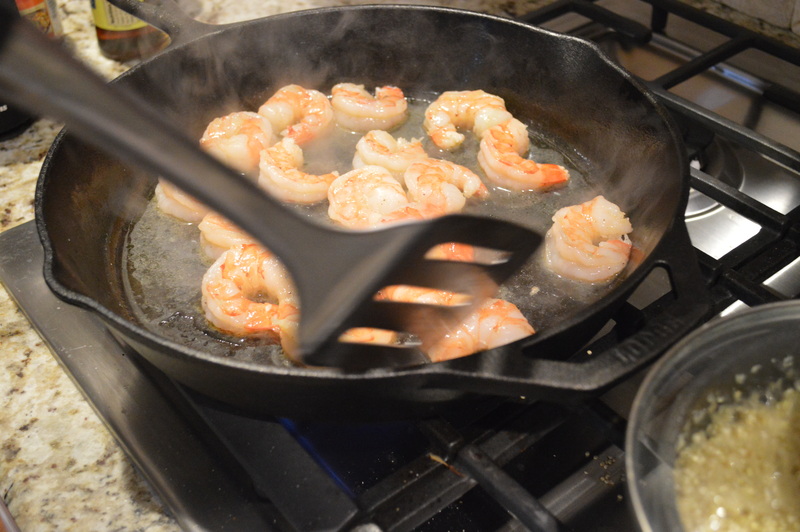 Add shrimp to skillet once oil is hot. Season with salt and pepper. Cook until pink, about three minutes. Remove to a plate and set aside. Add Kim-chi and chili garlic paste to skillet. Stir-fry until they are combined and fragrant. Add in cooked quinoa, fish sauce, and soy sauce. Stir constantly about three minutes. 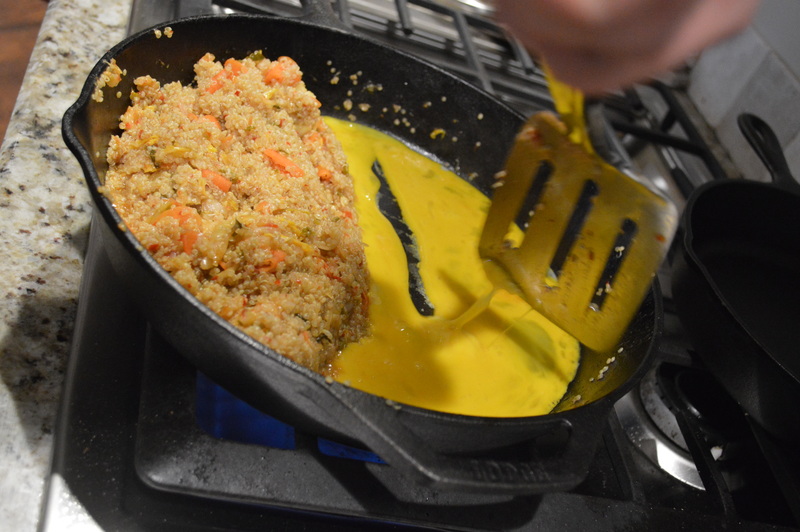 Push the quinoa mixture to one side of the skillet. Add the eggs and cook, stirring occasionally with a spatula about two minutes. Remove from heat and fold eggs into quinoa mixture. Add the shrimp, lime juice and rice vinegar. Stir to combine. Garnish and serve right away. Totally gonna make this sometime! 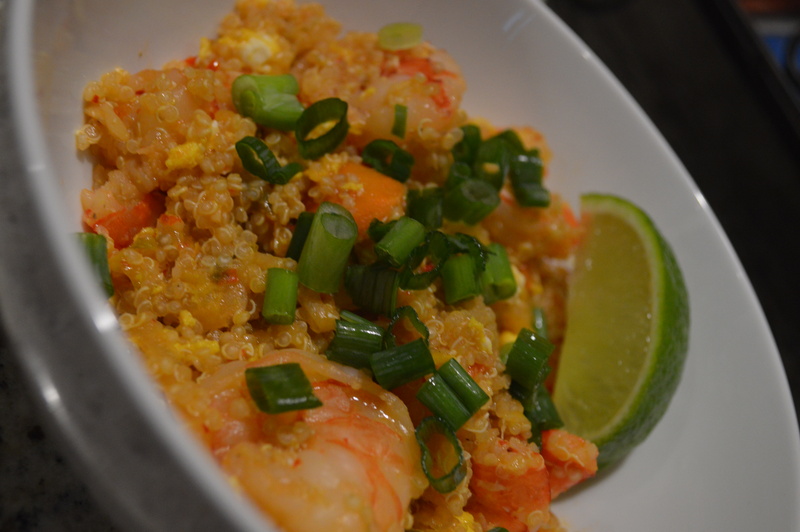 I’ve been using quinoa a lot recently and this recipe looks delish. Thanks Claire-o!